LOOK: NASA’s SDO captured its 100 millionth image of the sun - Balita Boss! After nearly five years, Atmospheric Imaging Assembly or AIA, just took its 100 millionth image of the sun on January 19, 2015. AIA is an instrument on NASA's Solar Dynamics Observatory (SDO). Launched in February 11, 2010, NASA’s Solar Dynamics Observatory (SDO) has provided images of the sun to help scientists better understand solar variability and how it affects life on Earth. SDO used AIA, which uses four telescopes working parallel to gather eight images of the sun – cycling through 10 different wavelengths -- every 12 seconds. 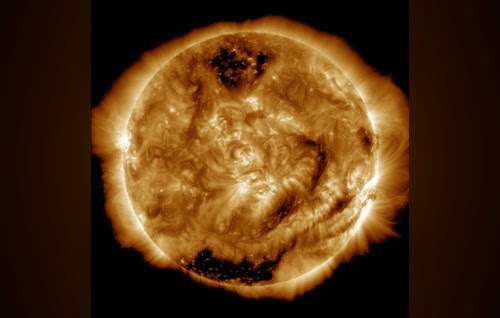 According to NASA, the dark areas at the bottom and the top of the image are coronal holes -- areas of less dense gas, where solar material has flowed away from the sun.